10, 20, 30 rule. Have 10 slides, 20 mins, and the smallest font is 30 pt. I really found this as a good way to think about how to give a presentation from a formation point of view. We hope to implement this rule when it comes to our presentations to help us move to have a more condensed clear and understood presentation. Don’t use the Dilbert mission statement generator have a mantra, that we can use to invite people to actually understand what we are doing. What we are doing from an academic point is easy to explain, but from a simplistic point of view, we need a mantra to simplify it and allow other people to quickly understand what we doing. Let 100 flowers blossom. In our case, this means to sort not to worry about the worry about who we get the data from, or whether or not we get the data. We should work with what we can get data wise and who we can get to survey. Don’t listen to the bozo’s/you don’t know what will work or won’t. There have been a lot of people who have told us that there is no way to really do what we plan to do very accurately. honestly, half the time I am not even sure we will be able to do it, but as long as we keep working and trying we will learn and find out new knowledge. Milestone assumptions tasks. This one is pretty obvious in regard to what to after last weeks blog. We have to first decide what we need to get done. Then we need to figure out what we are assuming, which we sort of did last week. Then we need to figure out how we will confirm the assumption and complete our milestones, which we sort of talked about last week. The first non-obvious assumption is that we can get our targets to actually talk to us and give us data. The second non-obvious assumption is that our target will actually give us data that we can work with. We also are assuming that this data is true and valuable. It is entirely possible that all the data we collect could be valueless. We also are assuming that the target audience will be able to understand what we are talking about, and therefore will be able to answer the survey. The next non-obvious assumption we are making is that expect to spend a lot more time collecting data, then we would have to if we’re in the USA or a more built up country. We also are assuming that we will have access to people and resources that will make it possible to collect data and process it. Another assumption we are making is that the statistics bureau in Sierra Leone will actually want to work with us. If they do want to work with us, will they collect high enough quality data that we can work with? The next assumption that we are making is that we can convince the ministry of health to sort of force the statistic bureau to continue to collect data for us when we leave. The final assumption that we are making on who we think is most at risk for spreading Ebola from bats to humans. The big first hypothesis we have to prove that we can connect bats to the spread of the Ebola. We know bats carry it, and we know humans can spread it, but we still haven’t been able to prove this is the cause of its spread between the two groups. Another hypothesis we need to test is that hunter bats are the most vulnerable to being patient zero and carrying the disease onward. We know from our research that people who eat bat are more likely to get Ebola. Therefore we need to confirm whether bats and high-risk animals are being eaten by not just hunters. We also hypothesize that these meats not being cooked cause the spread from bats to humans, so we need to confirm whether they are cooked are not at the markets. We hypothesize that people will be willing to give us honest and truthful answers when it comes to this survey. If they don’t do this our data won’t be accurate and basically useless in our context. Another hypothesis we need to prove is that transportation, in the regions, can be difficult allowing is to hypothesize that the spread is easier to track. We also have been hypothesizing that the spread might have something to do with the housing situations, so we need to see with our own eyes, what it is like. Another hypothesis we have is about burials of dead bodies, we need to see how they are buried after the epidemic to sort of decide if the burial process is as big as a problem as it has been stated to be. We also have hypothesized that knowledge of ebola is quite high and we need to confirm that the knowledge is there to prove the data has some value. The final hypothesis we need to confirm in the field is whether everything will work. Sounds simple, but is a major hypothesis we need to sort out. I think I bring three major qualities to the team. I think I bring a little organization to the team when it comes to sorting who is doing what, as well as what we need to do. The next thing I bring to the team is a sense of listening and understanding what is being said. I can process complex thoughts quickly which allows me to sort of help explain to those who are still having trouble. I think the final quality I bring to the team is having a keen sense of when to pick a battle. I think my team sort of shy away from battles, that we need to pick in order to advance the project forward. At the beginning of the class, I thought I naturally had the strength of being the face of something (a public speaking sense). Throughout the year I have learned that I have a lot of work to do with my public speaking. I also thought that I was really bad at organizing and understanding what to next. Turns out I was decent at it, or the competition of who I was being compared to was really low. I prefer to think it was the latter. Identify 10 specific things you will do to strengthen your next presentation (and responses). Plan for contingencies, like where will stand, having a clicker etc. Find a way to connect the data collection and the modeling together so the audience doesn’t get confused. Prepare to answer more questions, but also learn which ones to bring up in the presentation, and which we want to leave out, knowing that they will answer it. Does your work require IRB approvals? If yes, articulate your detailed IRB strategy. Unfortunately, the work on the Ebola team requires IRB protocols. We are going to shoot for an expedited IRB. We don’t fit under the criteria for an exempt protocol because we are dealing with humans as well as interviewing them to collect data. We don’t plan on keeping their names or any specific information regarding their data, so we don’t fit under the full either. We are sort of in the sweet spot, and therefore we believe that we fall under the expedited category of the IRB. From an actual strategy point of view, we are going to do a couple of things to make the IRB board happy/ like our project. The first strategy is to keep all data confidential and not correlated to anything other than then the interview number. We hope that none of us will be able to pair any of this data to names. I think this is one of the main things IRB will be looking for. The second strategy is to conduct our interviews with a wide variety of range of people but avoid a specific category of people (Pregnant woman, young children, etc.). This will allow us to gain data, without having to work with a group of people under stricter protocols. The third way in which hope to make the IRB board happy is by creating our questionnaire so that it guides the reader to the data we need without asking anything to compromise or that is considered too inappropriate. The final way in which we hope to satisfy the IRB board is by using the IRB protocol from when the project only involved bats as well as the proposal that was sent to the NIH for funding. We basically plan to name drop and use already approved protocols to sort of “WOW” the board with what the previous members of the team accomplished with their protocols. Through the use of these four concepts, we hope to get IRB approval as an expedited project. Develop a Logic Model for your venture. Give three examples of how you can use nature as a model/mentor/measure for your own designs (and life). The first example of how to use nature as a mentor is quite simple. Our project is to literally to understand why people are getting Ebola from nature. More specifically how they are getting it from bats and nature. If the start of humans getting the disease is from nature, then we have to look at the model in which it spreads. 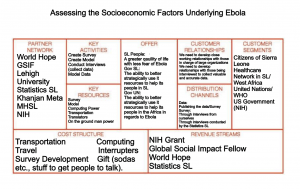 If we can understand how this model works, we can then begin to adopt the protocols, so that people don’t get Ebola. Understanding nature as a model is literally how we will build our project. The third way is that I can use life as a mentor is more of a measure. Nature tells you very clearly if you are hurting it or helping. When your grass goes brown you know you did something bad. If I could somehow figure out how to do that with life, I would be better able to understand what is helping and what is hurting. Now I know you’re going to say, “talking is the solution”, but that doesn’t always work. Resilience: In 2nd grade, I was diagnosed with dyslexia. Can you imagine barely being able to sound out a single word while the rest of your class is reading 20 pages of a book in a class period? Can you imagine the power a bully has over this type of person? Especially when you start popcorn reading. I had to work an hour a day with a tutor just to learn how to read, but it taught me that the battle is the fun part. The struggle is real and should be what you look for. Had I just given up, trust me there were many of time where I did for a little, I wouldn’t be able to sit here and type this. Talking the punches is valuable because it allows you to laugh your way through what seems like unsolvable tasks. I envision using the cradle to cradle design concept in the project by finding a way to not create a massive impact in collecting our data. Now the reality of our project is that our project is that collecting data requires a lot of energy, with this energy comes waste. If we can find a way to sort of use our energy more efficient or redesign the way in which collecting and analyzing the data happens we can better address this problem. This is going to sound ridiculous: the chocolate egg cream. I basically spent my summers as a child in Wisconsin, America’s Dairyland, yet I would have never thought that putting sparkling water and chocolate milk together would taste good until my friend ordered one. It’s a great combination and shows that you never know what will go well together. The rubber band in a stripped screw. My boss at work taught me this one. My bet is you know what I am talking about, but if you don’t; if you have a stripped screw that you can’t get out, put a rubber band between the screw head and screw. The screw will come right out. The final one is regarding how a sail works on a sailboat. I was a competitive sailor for all of high school, but the reason I began racing as a 13-year-old was that I had a science teacher explain that sails only push boats for only about 150 degrees of the 270 degrees you can actually sail. Sails are actually pulling the boats upwind in certain points of sail, their effectively wings on an airplane. 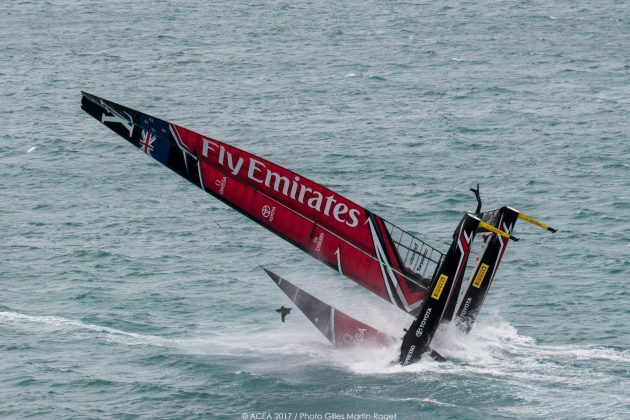 That’s why if you have ever seen a photo of the boat below you would be confused why they would have a sail that could change angles because conventional wisdom would tell you that there would be less surface perpendicular to the wind. The first major stakeholder of our project is the communities we plan to help in Sierra Leone. These villages and people are motivated by the fact that if our project succeeds we will be able to prevent unnecessary bloodshed. The issue you at the moment is that this group is more passively motivated than actively. Ebola is not a problem right now, so they have no real reason to help us because they have greater active problems. The second stakeholder in our project is the government of Sierra Leone. The government motivation is to prevent its citizens from dying, but also from a monetary point to use what little cash they have in the most efficient way possible. Ebola is a disease that can easily take over governments medical expenditure. The government by helping us complete our project helps it, citizens, while at the same takes out a sort of insurance policy that will hopefully lower the likely hood that this terrible disease does not crop up on their shores again. With what they don’t spend on Ebola they can spend elsewhere. The next stakeholder in our project is basically any NGO, like UNICEF or MSF. They basically have the same incentives as the government with the way this impact people, money, or resources. WIth these stakeholders, though they have an added incentive that if they don’t spend their money on Ebola, these groups can spend it elsewhere in the world, with greater problems. Now the issue with this is that like the community and the government they are more passively motivated to solve this problem because there are greater problems in the world. The fourth stakeholder in our project is the United States National Insitute of Health. The NIH is motivated to help us discover more about Ebola for two reasons. The first being the NIH is in it for science and the discovery of data that can help them better understand the disease, as well as how diseases like it behave. The second reason they are motivated is that they are funding some of the projects. They gave us this money, so they are motivated to see that money as well used as possible. Now, are they technically sort of a passive partner since they have already given us the money, yeah. But, that is not really relevant since we are spending their money, so they should be motivated to make sure we spend it the best way possible. You don’t give your money to a startup and walk away. If you do there is no guarantee you will get it back. You stay and give your advice to make sure you got the most amount of money back. The final stakeholder, for this list at least, is the group. By group, I mine professor and students. Now the motivation of the professors might be a little different than the students. They are getting paid to publish papers, do research, and do something like this for a living. The students are doing the same thing except instead of a nice paycheck, we get to pay 76k a year to participate. Technically we are getting paid during the summer, but to be honest 10 weeks of 400 bucks makes only a dent, so to say we are motivated by money Is not necessarily true. Though we differ in forms of economic motivation, professors and students are both motivated by the prestige of publishing work, doing the right thing, and Lehigh prestige. It’s not a zero-sum game, we all win in the end. Lehigh gets to say they collected data for the NIH, the professor publish work with students, all of which benefits Lehigh Reputation and status. One of the ways we plan to establish credibility to our project is to mention as much as we can that we are funded in part by the United States National Institute of Health. Mentioning that we are funded by the NIH should help with our credibility for sure. We can also validate our project by getting people from the CDC as well as the UNICEF to do a little consulting. If we can get these groups to say they worked with us, we will be able to mention them as defacto partners which will help with our credibility. The final way we can really validate our project is to have an actual product to show and that we can use. From a time point of view this is sort of unrealistic since the actual application/collection method will be built over the summer, but if we can get a demo product then we have something to show not an idea to show. This would hopefully help us with credibility. Give three compelling examples of how cultural issues affect your project? Culture and our project are bounded at the hip. In order to collect the data necessary for the project, the culture of Sierra Leone must allow for people to talk about Ebola. If people aren’t willing to talk or share information regarding Ebola, then the project will cease to exist. We are reliant on the culture regarding Ebola to be open. The second-way culture affects our project is the actual data that we are collecting. 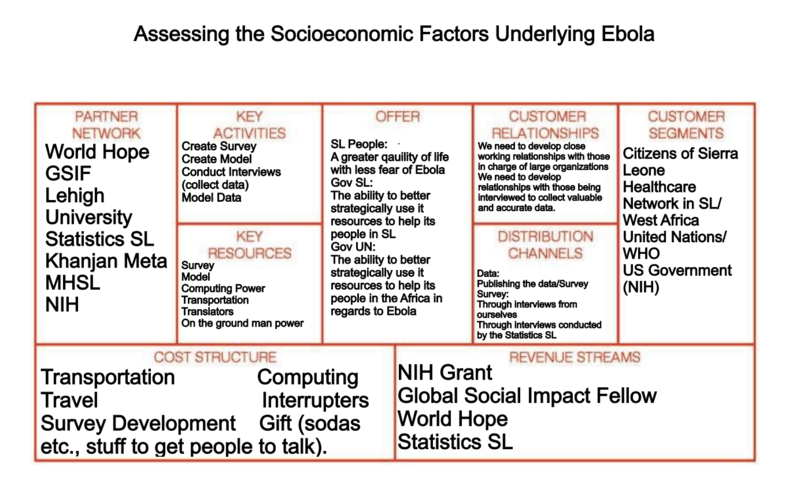 The data we hope to collect and analyze is literally what cultural norms impact the spread of Ebola. The data we hope to collect literally is affected by the culture because we don’t really know the culture, so we don’t really know what to analyze. Finally, the biggest issue regarding culture is the language barrier. Though they speak English our data is more targeted out those who don’t. Creating a survey that can be understood, and that collects the right data is a culture issue. Have you experienced any of these issues at home? Describe at least three issues. I have experienced all of these issues at home before with just different context. I have to have hard conversations about things that are normally taboo things to talk about. It can be difficult to get answers in these situations, and a lot of the time you have to persistent but respectful to get what you need. In regards to discovering culture norms, I have trouble understanding what an egg cream was for the longest time. This is sort of a weird thing to say as a cultural norm, but until I saw some drinking it. If we to ask me what dairy products people drink around here I wouldn’t know to include this. This goes to show that we don’t really know the small things about the culture around New York, so Sierra Leone will be a challenge. From a language point of view, I have a great example. The first day I got here I wanted to fill up my water bottle, so I asked where the “bubbler” was. We both spoke English and are from the same country yet my Gryphon had no idea what the heck I was talking about. For reference, a “bubbler” is the water fountain, one of those weird midwest terms. Give three examples of cultural practices that can be leveraged to address community/market problems. One of the hopes / one of the things we have been told is that people in Sierra Leone are quite open when it comes to talking about Ebola. This will allow us to have spent less time getting people to talk about the information that we need and more on collecting information that helps us prevent an outbreak. From a Lehigh point of view, one of the problems that I face on campus is the fact that the dining halls shut breakfast down at 10. I like to think that most college students like to sleep in, whereas the adults get up a little earlier. If they left these halls open another hour they would get more customers. I think closing at 10 is due to the time necessary to flip the halls for the next meal. If they staggered the switching of meals they could keep one place open long enough for the late resizers. The final cultural practice that could be leveraged to address a market problem could be the fact there is an abundance of plastic cups on college campuses. They all get thrown away, but if you could find a way to recycle them for the same price you could prevent waste and help kids get drunk without contracting a disease. In regard to your ventures, how does the African context present different challenges than the American context . Give at least three examples. Africa presents a lot of different issues than America does. The abundance of technology is different, technology is abundant just its not as high quality. People don’t have iPhones they have flip phones, which are quite different to build an app for. Another challenge with Africa is the difference of languages across a mear 10 miles, communicating can be quite difficult when you have to speak multiple languages, that you have never learned. Another challenge you can face in Africa is the transportation and logistics train. In the USA you can overnight a package from NYC to LA. That’s not possible, for the same distance in Africa (for the same price), due to the roads, airlines, cultural practices, and two big issues: Tanzanian traffic cops (with their white hats as well as customs and immigration. In regard to your ventures, how does the African context offer different resources than the American context . Give at least three examples. Well from an economic point of view the cost of labor, as well as certain prodcuts, is significantly cheaper, which (theoretically) could allow you to get things done cheaper and at a faster pace. Africa also offers technological advancements that the US does not. I know that in the Serengeti, you can snapchat your friend due to their being wifi in some of the vehicles. I had a Cell signal and called my parents at the top of Kilimanjaro. Technology grows and is affected differently their, which can be an upside if you can shape it right. The final big upside about Africa is that is that people have a different perspective than we do, and their solutions to problems can be concepts we couldn’t have ever imagined. They have don’t see the world like we do which can allow us to operate in ways we wouldn’t have too. I enrolled in this course for three reasons. The first reason I enrolled in this course was to have a class though might feel like a lecture isn’t a lecture. Though the class is a lecture it has aspects that most classes don’t have. The second reason I enrolled in the class because I get bored with hypothetical situations. Academic exercises can be very valuable, don’t get me wrong. You can fail with no consequences in these exercises, but soccer players don’t practice for fun. They practice to play an actual game against another team. I enrolled in this course, to play the real game not practice on the pitch. The final reason I enrolled in this course was to challenge myself. This course is nothing like anything I have done in the past, there is no right, no right answer, you sort of have either make it up at the beginning or make it up as you go. On top of the uncertainty, the task at hand is inherently difficult, to begin with. I am a sucker for a good problem and enjoy solving them, so I figured a class that would really challenge me, would be fun and interesting. How do you envision this course making you a better student? I envision this course making me better in four ways. The first way this course will make me better is by teaching me how to create an app and analyze the data gathered from this app. As a perspective Industrial engineer, building programs and analyzing basically exactly what I will be doing in the future, so to have real-world experience will be valuable to learn, valuable to people I can help during class, and valuable to my future. The second way I envision this course is by making me a better student is by giving me real-world experience. As I solve problems for this class, in the future, I will be able to reference them for ideas on how to solve my future problems. In my experience, the most creative solutions are the solutions borrowed for places that you have never heard off. By having experience, and something to look back on I will be able to solve more problems and create better solutions in the future. The third way I see this course making me a better student is through its ability to challenge to be able to handle more at a time, in a more efficient way. This course is very intensive and can cause a lot of stress Weightlifters, lift heavier and heavier weights, so they can get stronger. I hope that this course will stress me in ways that I can’t even imagine so that I leave the course with a stronger resilience to stress and juggling what life throws out me. The final way I hope the course will make me a better student by giving me a network of professors who I am close with and can run my ideas and issues by. Having someone who you know well and can ask questions to can be an invaluable resource to have. These mentors can lead you the right way so that you don’t make a wrong move. Otherwise, you are sort of flying blind. So to me, the logical solution is to train more eye doctors. The common sense answer right? This probably won’t work for two reasons. If you train a doctor he will move away because he will be able to afford to, and will want to leave for a better opportunity. It also quite difficult to train eye doctors in Africa, there aren’t the resources. So to solve the solution of not having doctors in the area. I would train a bunch of nurses to perform the simple tests regarding eyeglass fitting and then I would create a network of doctors through an online service who can provide care through facetime, or some type of face to face communication outlet. The more complicated test can be outsourced to mobile care centers. Now, these aren’t gonna be RV’s because they would never stand up to the roads in Kenya. They will be old safari vehicles which are cheap, reliable and have the perfect amount of space to conduct this eye exam. To create these glass I would get a conglomerate of companies like LensCrafters and such to lend expertise to create a factory. They will do this for the PR and here not really paying for it. Now how do you pay for it? You sell advertisement on the side of the vehicles. Have people face value for what they are getting. If they can’t afford to pay now, payment plan. Get donations for companies. Advertisement in the rooms and on the face to face communication system. Partner with US hospitals to help train their employees and have them provide the on-call experience. Take some Kenyan government money, if you can get some that isn’t going to corruption. To pay for training and the doctors on the ground, I would probably get a couple of doctors to come over in shifts and slowly train them.